What Can We Realistically Expect from the Miami Dolphins This Season? The Miami Dolphins are 0-1. This much we know. What we don't know is how they will fare for the rest of the season. At first glance last week's 30-10 loss to the Houston Texans looks pretty bad, but the reality is that it wasn't. It wasn't good, but it wasn't completely awful. Miami looked good on defense, and if not for a bad stretch of turnovers they would have looked even better. They were frustrating the Texans early in the game. Arian Foster looked like he had a great game because of his two touchdowns, but in reality he only averaged 3 yards per carry, which is much worse than his career average of 4.6. The Dolphins weren't as good on offense, but there were some encouraging things. Reggie Bush ran the ball really well, and you can bet he will have a big year as long as he's healthy. Passing the ball wasn't as easy, and it was obvious that we were watching a rookie QB making his first career start against one of the best defenses in the NFL. But in Ryan Tannehill's defense, he did really well considering what he faced. I am actually extremely encouraged by his performance. If he can learn to stop staring down his receivers I think that we can finally say that we have our franchise quarterback. The truth is that our entire season depends on Ryan Tannehill and how he performs. That's a lot to ask a rookie, without a doubt, but it is what it is. Injuries have put us in this position and we're going to make the most of it. Can we make the playoffs? It's a definite possibility. Not a likelihood, but a possibility. We have the defense. We have the running game. We have the easy schedule. What we don't know if we have yet is the quarterback. This season is rested squarely on Tannehill's shoulders. No pressure, Ryan. None at all. You're just the first rookie quarterback in the history of the Miami Dolphins franchise to start on the opening game. You're just the one tasked with fixing 13 years of inadequacy at quarterback since The Great Number 13 himself retired. You're the rookie who is already being extremely-unfairly compared to "he who must not be named" (rhymes with Man Darino). We believe in you. I genuinely believe that he will be able to handle the pressure. If there's one thing I've noticed about Ryan Tannehill, it's that he isn't easily shaken. Sure, he'll make mistakes. Every quarterback in the history of the world made mistakes. The key is that he is able to remain composed and continue to play without fear. He already knows the offense, which is a major bonus in his development. Instead of worrying about the playbook he is able to work on other things like the use of his eyes, feet, and (of course) arm. I realized that I've never really stressed enough how much knowing the playbook helps his development. A big obstacle for NFL rookies is learning the playbook that's as thick (technically not true anymore because of iPads) and comprehensive as a dictionary. That's one obstacle that Tannehill is able to step right past. I really think the kid can do it. Maybe not initially, although I wouldn't completely rule him out this year, but I think in the long run he will be exactly what we're looking for. This article isn't about the long run, though. I'm supposed to tell you about what I think will happen this season. Well, my honest assessment is eight or nine wins and in the playoff hunt. It's not as crazy as you think. Look at our schedule (and keep in mind our great defense when doing so) and tell me how many of those games aren't winnable. 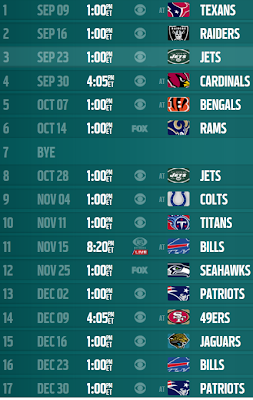 The only remaining games that I see for us as highly unlikely wins are the two Patriots games and the 49ers game. The rest (2 Jets, 2 Bills, Raiders, Cardinals, Bengals, Rams, Colts, Titans, Seahawks, and Jaguars) are very winnable games. Let's say we split with both the Jets and Bills. That means Miami only needs six more wins to finish with an 8-8 record, and that is very doable with the games they play. Now, I don't think we'll make the playoffs, but an eight or nine win season is respectable. An 8-8 or 9-7 record would also mean that Jeff Ireland likely stays as the General Manager of the Dolphins, which I really hope happens (half of you are excited by that statement, while the other half of you probably won't be able to read the rest of this because you just broke your computer monitor). 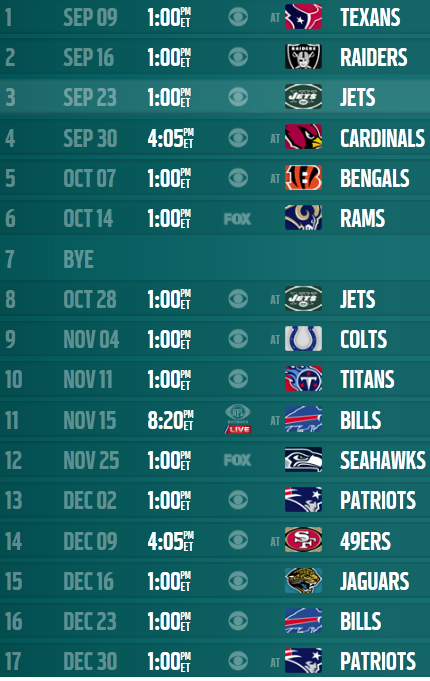 An 8-8 or 9-7 record would give Miami and Ryan Tannehill tremendous momentum going into next year. Just think about our five draft picks in the first three rounds. Think of how much we can improve our team with those five new guys. This all sounds too good to be true, but it is actually a very possible and very real scenario. We aren't that far away from being a successful NFL team. Have we found our franchise quarterback? I know it's early, but I sure think so. Isn't that what we've been looking for all these years? Isn't it a shame that now that we finally seem to have him some of us can't be excited because we're missing a piece or two that can be replaced much more easily? Get excited everyone. Who cares about this year, or even next year (of course I do, but follow along with me here)? It's looking like we might have our quarterback for the next 15 years. He might not be Dan Marino, but he can definitely play some football. Best of all, he's going to be built the right way by a coach who has experience developing an elite quarterback in a system that is very similar to our own. I'm telling you guys. This negativity is all shortsighted. Look at the long term.